Je vous invite à prendre connaissance du rapport publié par Ernst & Young Center for Board Matters dans lequel on présente les résultats d’une enquête portant, entre autre, sur la composition des CA et sur les mécanismes de renouvellement des membres du conseil. Il y a vingt ans, il y avait peu d’interrogations sur la matrice des compétences, des habiletés et des expériences des membres des conseils d’administration. De nos jours les actionnaires veulent savoir si leurs élus sont aptes (1) à accompagner la direction dans l’exécution de la stratégie et (2) à superviser la gestion des risques (voir mon billet sur ce sujet Trois étapes pour aider le CA à s’acquitter de ses obligations à l’égard de la surveillance de la gestion des risques). Le problème du renouvellement des membres du conseil, l’absence d’une politique claire concernant le nombre limite d’années de service au conseil, ainsi que le manque flagrant de diversité sur les conseils sont des facteurs-clés qui amènent les actionnaires à exiger une plus grande divulgation des profils des administrateurs et un processus de nomination plus ouvert, lors des assemblées annuelles. More than three-fourths of the investors we spoke with believe companies are not doing a good job of explaining why they have the right directors in the boardroom. Companies can improve disclosures by making explicit which directors on the board are qualified to oversee key areas of risk for the company and how director qualifications align with strategy. Providing clarity around how board candidates are identified and vetted and the process for supporting board diversity goals may also strengthen investor confidence in the nomination process. Rigorous board evaluations, including assessing the performance of individual board members, as well as the performance and composition of the board and its committees, are generally considered valuable mechanisms for stimulating thoughtful board turnover, but views about other approaches (e.g., term limits) differ widely. L’article présente les avenues à explorer pour améliorer la composition des CA. Également, l’article propose trois bons moyens pour renforcer la divulgation liée à la composition du conseil. Enfin, l’article présente une manière originale de conceptualiser le renouvellement des conseils, en s’appuyant, notamment, sur de solides évaluations des administrateurs. Voici des extraits de l’article. Bonne lecture ! Despite investor acknowledgement that some leading companies are doing an excellent job in this area, most of the investors we spoke with believe companies are generally not making a compelling enough case in the proxy statement for why their directors are the best candidates for the job. Make disclosures company-specific and tie qualifications to strategy and risk: Be explicit about why the director brings value to the board based on the company’s specific circumstances. Companies should not assume that the connection between a director’s expertise and the company’s strategic and risk oversight needs is obvious. Also, explaining how the board, as a whole, is the right fit can be valuable, particularly given that most investors are evaluating boards holistically. Provide more disclosure around the director recruitment process and how candidates are sourced and vetted: Disclosing more information around the nomination process—how directors were identified (e.g., through a search firm), what the vetting process entailed, etc.—can mitigate concerns about the recruitment process being insular and informal. Discuss efforts to enhance gender and ethnic diversity: Many companies—nearly 60% of S&P 500 companies—say they specifically identify gender and ethnicity as a consideration when identifying director nominees, but that is not always reflected in the gender and ethnic makeup of the board. Disclosing a formal process to support board diversity, including providing clarity around what is considered an appropriate level of diversity, can highlight efforts to recruit diverse directors. A skills matrix tied to company strategy can be a valuable disclosure tool but is not the only way to convey a thoughtful approach. A letter from the lead director or chairman that discusses the board’s succession planning and refreshment process and any recent composition changes can also be effective. Beyond disclosure, engagement can provide investors a valuable dimension in assessing board quality. Involving key directors in conversations with shareholders can provide further insight into board dynamics, individual director strengths and composition decisions. 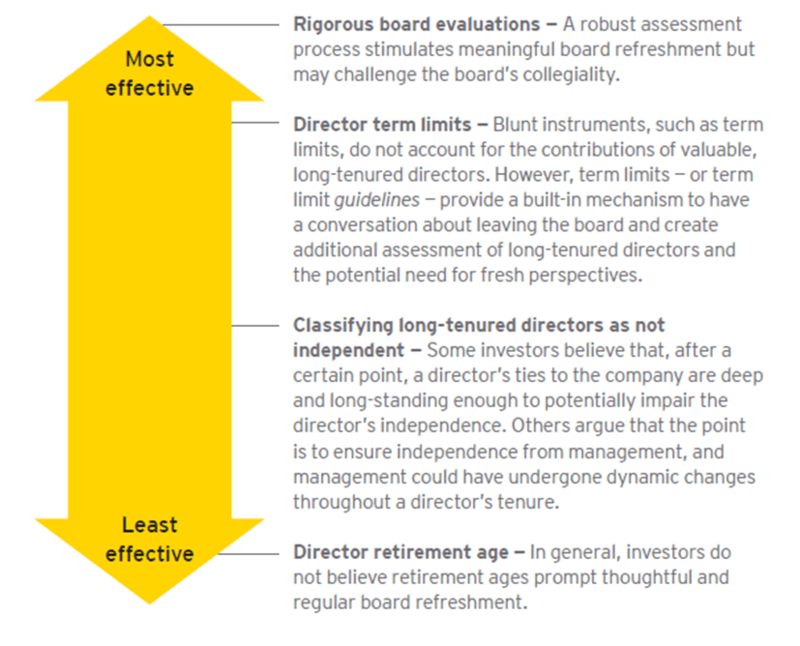 When we asked investors what mechanisms boards can use to most effectively stimulate refreshment, the vast majority chose rigorous board evaluations as the optimal solution and director retirement ages as the least effective. However, views around the different mechanisms and how they should be used vary—as does how investors approach the topic of tenure altogether. Some investors evaluate tenure and director succession planning as a forward-looking risk, while others focus on past company performance and decisions. The commentary below represents investor opinions on each mechanism. One of the top takeaways from our dialogue dinners was the importance of robust board evaluations, including evaluations of individual board members, to meaningful board refreshment and board effectiveness. Some directors noted the value in bringing in an independent third party to facilitate in-depth board assessments and in changing evaluation methods as appropriate to reinvigorate the process. Some also noted that board evaluation effectiveness relies on the strength of the independent board leader leading the evaluation. When it comes to how boards manage director tenure internally, setting expectations up front that directors’ board service will be for a limited amount of time—not necessarily until they reach retirement age—is important. We’ve heard from some directors that having periodic conversations with individual board members about their future on the board is valuable and can help provide “off ramps” and a healthy succession planning process. Given investors’ increasing focus on board composition, companies may want to review and enhance proxy statement disclosures to ensure that director qualifications are explicitly tied to company-specific strategy and risks and that the board’s approach to diversity and succession planning is transparent. Beyond disclosure, ongoing dialogue with institutional investors that involves independent board leaders may allow for a rich discussion around board composition. Also, through regular board refreshment and enhanced communications around director succession planning, companies may head off investor uncertainty and temptations to go down a rules-based path regarding director terms.